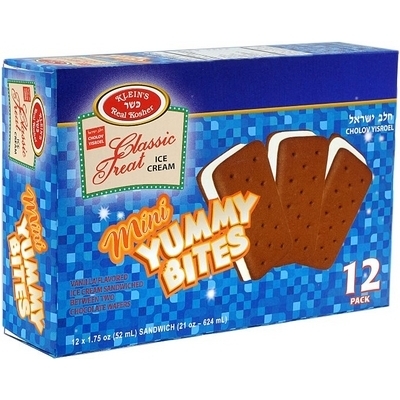 Yummy`s definition is a delicious Klein`s sandwich Ice Cream, more than just delicious, it`s available in a perfect mini size. Two chocolate cookies, sandwiched with creamy Vanilla is an all time child favorite, as well as for adults. Ingredients: ICE CREAM: Milkfat, nonfat milk, corn syrup, sugar, high fructose corn syrup, guar gum, mono & diglycerides, cellulose gum, polysorbate 80, carrageenan, locust bean gum, vanilla extract. WAFER: Bleached wheat flour, sugar, caramel color, corn sugar, vegetable shorting, (partially hydrogenated oils:soybean, cottonseed,) yellow corn flower, cocoa, high fructose corn syrup, corn syrup, modified coern starch, baking soda, salt, mono & diglycerides, soy lecithin.